↑ أ ب Shapley، Harlow؛ Sawyer، Helen B. (August 1927)، "A Classification of Globular Clusters"، Harvard College Observatory Bulletin (849): 11–14، Bibcode:1927BHarO.849...11S. ↑ أ ب Forbes، Duncan A.؛ Bridges، Terry (May 2010)، "Accreted versus in situ Milky Way globular clusters"، Monthly Notices of the Royal Astronomical Society، 404 (3): 1203–1214، Bibcode:2010MNRAS.404.1203F، arXiv:1001.4289 ، doi:10.1111/j.1365-2966.2010.16373.x. ^ Baumgardt, H.؛ Côté, P.؛ Hilker, M.؛ Rejkuba, M.؛ وآخرون. (2009). "The velocity dispersion and mass-to-light ratio of the remote halo globular cluster NGC2419". Monthly Notices of the Royal Astronomical Society. 396 (4): 2051–2060. Bibcode:2009MNRAS.396.2051B. arXiv:0904.3329 . doi:10.1111/j.1365-2966.2009.14932.x. ^ van den Bergh, Sidney؛ Mackey, A. D. (2004). "Globular clusters and the formation of the outer Galactic halo". Monthly Notices of the Royal Astronomical Society. 354 (3): 713–719. Bibcode:2004MNRAS.354..713V. arXiv:astro-ph/0407346 . doi:10.1111/j.1365-2966.2004.08228.x. ^ RIPEPI V.؛ CLEMENTINI G.؛ DI CRISCIENZO M.؛ GRECO C.؛ وآخرون. (2007). 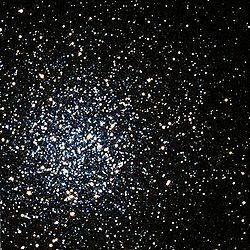 "On the remote galactic globular cluster NGC 2419.". The Astrophysical Journal. 667: L61–L64. Bibcode:2007ApJ...667L..61R. arXiv:0705.0966 . doi:10.1086/522000.